I started back at yoga this month after almost a 2 year absence. I would try to do it at home once in a while, but going to a class seemed overwhelming and my ego prevented me from showing up and looking bad. Ego is something you are supposed to leave at the door in yoga, yet being a competitive person, I struggle with that. But one Wednesday evening, shamed by the fact that the reminder for the class was still on my phone (I’d been dismissing it each Wednesday for a long time) I got myself ready and out the door before I could over think it. I told myself that I was just doing it to stretch. Perfection or ability was not the point. I walked in to the familiar classroom, found a spot and started in. And like riding a bike, it came back to me easily. I didn’t push myself, I focused on my own moves and didn’t compare. I worked really hard at finding my own balance, internally and on the mat. After class, I asked the instructor if I needed to sign the list and he said they didn’t do that anymore. Then he looked at me and said “It’s been a while.” I told him it had been, but I was glad to be back to it. He told me I looked good in my form and that with a little more practice the strength would come back to me. I felt good hearing that and knew that the following day, I would be feeling muscles that hadn’t been challenged in a while. But that’s a small price to pay to restore balance. Yoga had been a way for me to let go of the stresses of life and work, but in all the chaos of the last 3 years, it got set aside somewhere and I stopped going. I would mean to go, but then be overcome by events. Eventually, I stopped pretending and just let it be. I worried I would lose all flexibility and balance, two things I really wanted to retain. I knew my focus had been on others the past few years, but periodically while traveling, I would go to a hotel gym to do a little working out. Once I returned home, my resolve would fade. During those trips, all I had to worry about was me. Somehow, my day to day life at home became more about staying on my tightrope and less about inner peace. What I enjoy about yoga is that it is really all about you for an hour – your body, your moves, your ability, and your intentions. I find I do best when I can get to the point where I can just close my eyes, follow his words and look inward. I leave the class restored and recharged, pleasantly weary, and ready to face what’s next. I am grateful for the opportunity to stretch both body and mind at the same time. Last class, at the end, we were preparing for shavasana, the relaxation at the end of practice. The instructor referred to it this time as “the corpse pose” and I thought how I now knew more about corpses than I had before. As I settled in to my pose, I felt a connection I had never had. I started talking with mom, dad and Jan, telling them I was taking care of myself and I was doing OK. I felt like they were with me and I told them I felt them there. Again, the words that came to me were “all will be well” and I used that to focus the remainder of my relaxation, almost like a mantra. I felt tears sliding down the sides of my head; the feeling of connection was one that I had craved for a long time. I really miss my people. I expected to be wobbly and weak, starting back up. I found that I was able to do more than I thought I could and I felt stronger than I expected. I guess that even though I haven’t been taking care of myself as well as I should have, I haven’t completely gone to pot. My body sometimes got in my way, but that will get better. I am still flexible and my balance is good. My days as a tightrope walker are fewer. I have my feet on the ground most of the time and I feel balanced and connected in a way I haven’t in years. 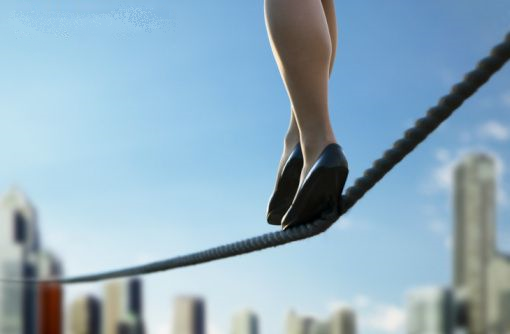 I am stepping off the tightrope and enjoying solid ground in a more balanced world. It’s about time. This entry was posted in Exercise, Family, General Rambling, Support. Bookmark the permalink. How fantastic for you! You’re an inspiration. Beautifully written, as always! Love you, too, George!! And you look Marvelous – I saw the latest pics!